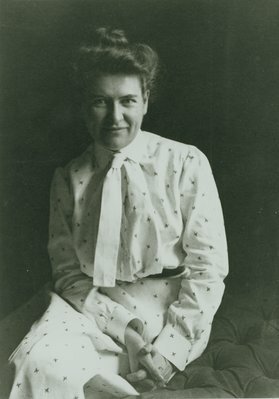 Willa Cather today, but if you blink you might think it’s Anton Chekhov in Nebraska. This is a beautiful little story where very little happens, but the mood created is perfect. The enchanted bluff is nice. One of the boys on a swimming trip tells the story of a mysterious, uncharted bluff in New Mexico, and it winds up standing in as the naïve, optimistic ambitions and dreams of childhood. But this story, for me, was more of a mini-portrait of the Arthur Adams character. Despite never really rising above a supporting role, Adams looms over the whole thing with a tragic solemnity. He is Sandtown personified. He is their childhood personified. And that’s quite a trick on Cather’s part. The tall boy was Arthur Adams. He had fine hazel eyes that were almost too reflective and sympathetic for a boy, and such a pleasant voice that we all loved to hear him read aloud. Even when he had to read poetry aloud at school, no one ever thought of laughing. To be sure, he was not at school very much of the time. He was seventeen and should have finished the High School the year before, but he was always off somewhere with his gun. Arthur’s mother was dead, and his father, who was feverishly absorbed in promoting schemes, wanted to send the boy away to school and get him off his hands; but Arthur always begged off for another year and promised to study. I remember him as a tall, brown boy with an intelligent face, always lounging among a lot of us little fellows, laughing at us oftener than with us, but such a soft, satisfied laugh that we felt rather flattered when we provoked it.